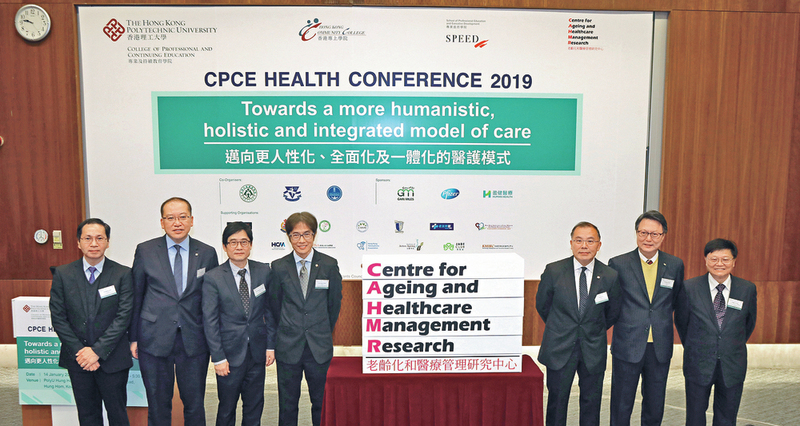 The Centre for Ageing and Healthcare Management Research (CAHMR) has officially been inaugurated at the PolyU College of Professional and Continuing Education (CPCE)’s recent 2019 Health Conference . With the number of Hong Kong’s senior population reaching a new high, the issue of enhancing their quality of living has been a regularly debated topic in recent years. The Institutional Development Scheme (IDS) of the Competitive Research Funding Schemes has approved a HK$ 2.45 million funding for the Local Self-Financing Degree Sector of the Research Grants Council (RGC) to establish the CAHMR, which was officially inaugurated recently at CPCE’s 2019 Health Conference. A panel of esteemed academics and experts were invited to convene and speak on the issue of ‘Towards a more humanistic, holistic and integrated model of care’, and among them, Dr. Ching-choi Lam, BBS, JP, CEO of Haven of Hope Christian Service and Member of Executive Council of HKSAR, shared on the fundamental topic of ‘Dying-in-Place: Advancing End-of-life Care in Hong Kong’, garnering wide attention. Lam concludes that there are many barriers to overcome to foster better end-of-life care in Hong Kong which includes legal, operation and organizational, as well as social and cultural aspects, but results are certain if efforts are made, and the fact that the Haven of Hope Christian Service has managed to reduce hospitalization periods of seniors by 14.5 days per person as well as save more than HK$340 million on end-of-life care per year is proof.